"The “Old” Don Jail opened in 1864 and closed in 1977. 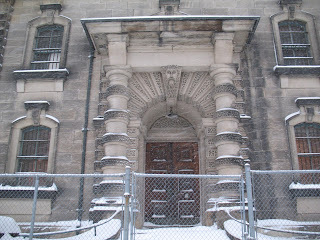 It was Toronto’s fourth jail, replacing the one on the site of the old Parliament Buildings at Front and Parliament. While in the years just before it closed it was considered "an embarrassment to the Canadian criminal justice system," when it opened it was called the "Palace for Prisoners." at that time it represented a tremendous advance in the public attitude toward the treatment of law breakers. Until then, (as was then the world wide custom) prisoners had been confined in appalling and inhumane conditions. Its architect was William Thomas, who also designed St. Michael's Cathedral and St. Lawrence Hall. Construction started in October, 1859, and it was almost completed when, in 1862, a disastrous fire necessitated its rebuilding. The firm of William Thomas and Sons reconstructed the building, to his original plans, and it was occupied in January, 1864. William Thomas ranks as one of Canada's leading architects. He was born in Suffolk, England in 1799 and came to Canada in 1843, where with two of his sons, he established a successful architectural firm in Toronto. He was a master of Classic and Gothic design, and some of the finest buildings in Ontario were designed by the firm. 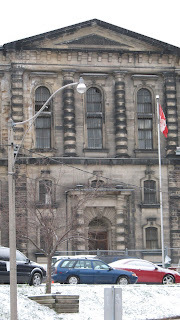 He did not live to see the Don Jail completed as he died December 26, 1860. 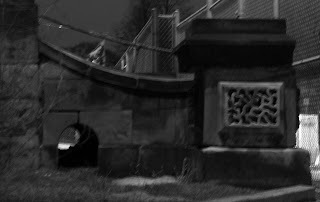 He is buried in St. James' Cemetery"
This building I find both fascinating and creepy. 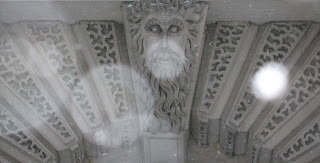 The last prisoner in Canada was hung there in the 1960's The carving over the door I call the jail god. The face is neither threatening or judgemental but seemingly all knowing yet oblivious I have gone by this entrance at least a thousand times and never noticed it before. The entrance is blocked by steel fence. I shot most of these photos during a snowstorm as a cheap way to highlight the eerie quality of the place. 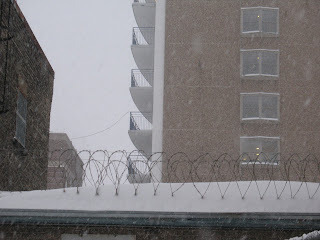 The barbed wire atop the west end of the old structure is oddly decorative. Regardless of the buildings function(s) the stone work is stunning. I will go back and shoot more of the carving.